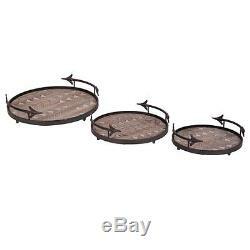 Arrow Nesting Trays, Set of 3. Set of 3, metal and wood, Arrow Nesting Trays bring unique on trend style to your home. Use these sturdy trays for serving guest or for decorative display in your home. Trays conveniently nest for storage when not in use. Dimensions: Large 15 x 15 x 4", Medium 13.75 x 13.75 x 4", Small 12 x 12 x 3.5. Convenient nesting design for storage when not in use. Place all items you are purchasing from our store in your cart and proceed to check out. Items must be checked out at the same time. The item "Arrow Nesting Trays, Set of 3" is in sale since Thursday, June 15, 2017. This item is in the category "Home & Garden\Kitchen, Dining & Bar\Dinnerware & Serving Dishes\Trays". The seller is "reddoor_home" and is located in Midland, Michigan. This item can be shipped worldwide.